Want to create professional eLearning courses in a snap? Join us for an expert webinar series and go through the whole process from A to Z. Who doesn’t want to save time at work? The use of a collaborative authoring tool can be a real game-changer for eLearning providers. To find a truly powerful solution that streamlines your eLearning production, don’t go shopping around unless you’re armed with these 5 vital questions. Why could an extended enterprise LMS be better for your training business instead of a normal LMS? Let’s take a look at the key benefits of an extended enterprise LMS. It’s not only your learners that need to be evaluated at the end of a course: it’s the course itself. Following our 4 simple post-course evaluation steps will help you improve your training content, fix the pain points your learners face, and step up your eLearning game. Whether your business is big or small, a Learning Management System can help you maximize online training effectiveness. However, you need to find an LMS platform that’s custom-tailored to your organization’s needs. In this article, I’ll share the top 5 differences between an SMB-focused and an Enterprise LMS. 6 Examples of How You Can Promote Informal Learning In The Workplace is an eBook designed to provide practical insights on how can you promote informal learning in your organization. Do you want something that can revolutionize your training instantly, but without spending any money? Look under the tree, and unwrap this simple trick! By giving learners instant accessibility to training content, mobile learning bridges the gap between content availability and learner requirements. Here is how to ensure that this incredible medium is utilized to its full potential. Ever interacted with an Artificial Intelligence Virtual Assistant? Chances are you have but mightn’t know it. Digital transformation has completely altered the way we learn at work and our relationship with technology. So, how do you know if on demand training is a right choice for your organization? Everybody loves freebies. But is there a way to boost your conversion rates with a single downloadable eBook? In this article, I’ll share tips to maximize results with an effective content marketing strategy that hinges on one eBook. Each team culture is unique, and so is the path to effective collaboration. In this article, you’ll find 3 proven strategies to embrace and enhance collaborative leadership. The impact of good stories in eLearning or any form of learning need not be emphasized more thanks to their successful adoption over the years. In this article, I will share few examples of good storytelling in the context of eLearning. Knowing how to create a Moodle quiz is going to be essential for Moodle administrators and teachers as it is a great way to test knowledge comprehension before, during, and after modules and courses. Why performance support needs to be accessible and applicable exactly when it’s needed. Videos are used in a plethora of ways to deliver engaging learning experience. Content is provided in the form of short duration video nuggets that trigger problem-solving and give customized solutions. Different ways to consider voiceover and some of the nuts and bolts of working with audio and video for your eLearning course. Read more! What’s Your Learning Leader Type? Regardless of what you do or how long you’ve been doing it, you should always be looking for ways to get better. Proving business impact and training ROI is the “Holy Grail” for today’s learning executive. After all, the learning department does not exist to deliver training. It exists to improve employee performance. Here are 3 approaches you can take to help you earn your spot at the executive “round table”. What are assessment options for online learning? The next series of articles shares some examples. This article begins with one of the most powerful types of online assessment–Computer Adaptive Testing (CATs). The College of Veterinary Medicine at the University of Illinois is seeking an Instructional Designer to provide consultation and support services in instructional design, strategies, assessment, technology, and distributed learning for instructional development projects for the College of Veterinary Medicine. This is a regular, full-time (100%) academic professional position. Allen Communication Learning Services offers a suite of performance improvement solutions designed to support client needs for business transformation. Our solutions include upfront analysis and development of web-based training, instructor-led training, performance support, etc., for a select (Fortune 500) clientele. Lead the Learning and Development practice for the 4A’s. Do you have a way with words? Does creative collaboration give you goosebumps? Are you a tech nerd with a passion for helping people be successful by creating persuasive and engaging learning experiences? Are you looking for a new career or a career change? If so, then Allen Communication Learning Services wants you on our diverse team. What if your career could change your life? The Mayo Clinic Education Innovation team develops impactful and innovative educational products and businesses for healthcare professionals through user-centered rapid prototype development and testing. The team is looking to hire a strong eLearning Specialist who is self-directed, creative, adaptable, and brings a positive enthusiasm to their work. To help people make the most appropriate decisions when it comes to working with others and/or recruiting, promoting and managing them, Engage in Learning has launched a video-based, interactive online learning programme on ‘Unconscious Bias’. LEO Learning and LOMA’s mobile game, Impact Cx: The Quest, wins prestigious mobile learning award at the 24th Annual Communicator Awards. Opportunities for card fraud are being minimized by the Payment Card Industry Data Security Standard (PCI DSS) and by related learning materials, such as those launched recently by Engage in Learning. The nation’s top learning and employee engagement experts reveal best practices for building a superior professional development program that supports business growth and workforce retention. mLearn 2018 CfP Extended… With Perks! Not enough time to submit your mLearn 2018 paper, workshop, tutorial, or presentation? We’ve got you covered! The CfP for all mLearn 2018 submission categories has been extended to 20 May 2018… with some added perks! This live, online Training magazine workshop, starting on June 5, 2018, will help you “rethink” and “invigorate” the design of your content for faster development and easier learning suited for those who are on-the-move, on-the-job and mobile. EduTECH 2018 is the largest education event in Asia Pacific and the Southern Hemisphere held in Sydney on June 7 and 8, 2018. Why You Are Struggling To Engage Your Learners Online, And How To Solve This! 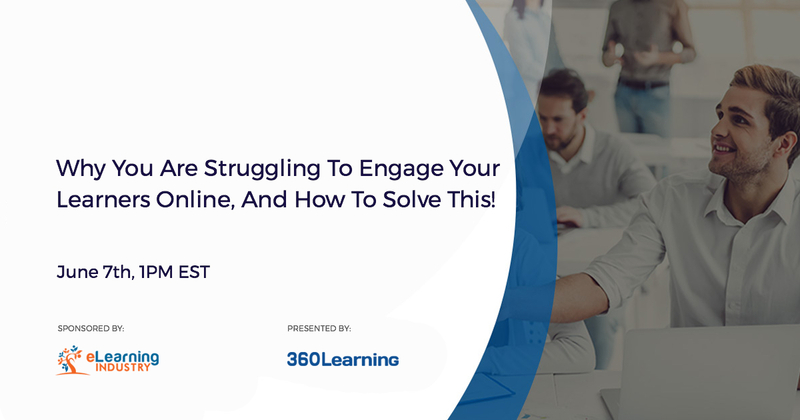 Join us for Why you are struggling to engage your learners online, and how to solve this, a free webinar presented by 360Learning’s Vice President of Sales, Jean-Christophe Bourgade, and sponsored by eLearning Industry. Get insight on how to reach full engagement from the audience of your training programs, and move closer to the success of your business objectives. The event is scheduled for the 7th of June 2018. Join dynamic industry experts and practitioners at CommLab India’s Training Challenges and E-learning Solutions Summit 2018 and discover how to use digital learning solutions to accelerate employee performance. Join us for Onboarding On Auto-Pilot: Build Better Teams Faster With eLearning, a free webinar presented by John Coffee on behalf of Docebo, and sponsored by eLearning Industry. The event is scheduled for the 21st of June 2018. Have you ever wondered whether Millennials Have It Better or worse than generations past? Check this very interesting infographic on whether Millennials Have It Better or worse and this will help you understand how things work for them in the real world today compared to the generations of the past. What are some possible things you have to consider when choosing a School Management System? This very informative how to choose a School Management System Infographic can help you a great deal so you can make the best choice possible. Reading is an exercise for the brain which can strengthen neuronal pathways as well as create new ones. Being immersed in a book can help reduce stress and improve sleep. This how Reading Improves Your Mind and body infographic can help you realize the positive effect reading has on you every time you practice it. Reading this very informative how an LMS Can Help Independent Entrepreneurs infographic will definitely help you find out all about Learning Management Systems and their capability to assist you in your entrepreneurship attempt since it is clear that an LMS Can Help Independent Entrepreneurs. This infographic about today’s Adult Learners will help you realize who they are and what they prefer doing as regards their studies online. Check this very informative infographic on who today’s Adult Learners are and learn all about their preferences and interests. In this Adobe Captivate QuickTip, I demonstrate the workflow I use when adding a trim edit when I want to maintain an existing pan and zoom. zipBoard simplifies your workflow for creating eLearning content. This video describes how zipBoard helps you manage and track your different eLearning projects. Just one email each Tuesday. No Spam, Easy unsubscribe – your email is safe. Want to see what an issue is like? Check out the eLearning Weekly Issue #273 here or see our full eLearning Archive.